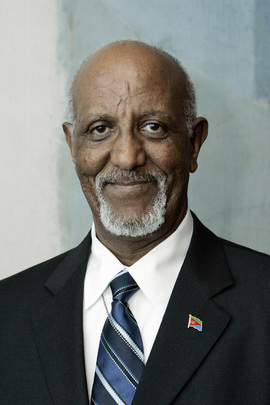 UNITED NATIONS, December 2 -- "No one will come" from Asmara to the UN in New York on Monday, Eritrea's Permanent Representative Araya Desta told Inner City Press after 5 pm on Friday. After a Security Council fight resulting in an eleventh hour invitation to President Isaias Afwerki to address the Council on Monday just before new sanctions on Eritrea are slated to be voted on, throughout Friday afternoon there was discussion that the US hadn't come through with visas. But by 5 pm the US bragged that 11 visas were being granted, for pick up Saturday morning. This put the ball back in Eritrea's court. Three times Isaias Afwerki had asked to address the Council before it votes on further sanctions. The request was ignored until Gabon and the United States on November 29 pushed for a vote on sanctions the next day. Facing opposition, it was agreed to invite not only Isaias Afwerki and but also leaders of Eritrea's neighbors to address the Council Monday morning, then vote on Monday afternoon. But as Desta told Inner City Press on Friday night, this schedule lacked due process. He said, "They [fouled] it up, I'm sorry to say it that way. That's what Doctor Rice wants. No one is coming." Desta provided reasons of timing, and of due process, first calling it "short notice, we would have had to arrange a charter. You don't ask a president to come within a day and a half." Still he emphasized, "My President was ready to come." Then Desta pointed out that the sanctions resolution will already be "in blue" -- what if Security Council members wanted to consult that capitals after hearing the morning's speeches? He said, "the Security Council should take time, the experts should meet and discuss on each and every paragraph. They don't want to do that. There is no crisis in the region. So what is the reason they are bringing it in a rush? You wrote it yourself, they didn't want to deal with the Russians." To many, the push on November 29 to haul off and vote on November 30, the last day of Portugal's Council presidency, seemed strange. Desta said, "the way Doctor Rice has done was imposition, really outrageous." Araya Desta, Perm Rep of Eritrea: "No one will come"
It does look like a strange compromise now. As one Council member mused to Inner City Press, "to put a head of state into a situation in which he speaks to the Council in the morning, and they adopt sanctions against his country in the afternoon, is a set-up for a no-show." Another suggested that the Council should have scheduled the President to speak as early in December as he could, and then hold the vote on another subsequent day. But that appears no longer here nor there. "No one will come," Desta told Inner City Press. Watch this site.